Berkshire's fire authority has asked the government to help pay costs from a major fire in Swinley Forest. Royal Berkshire Fire and Rescue Service (RBFRS) has applied for a £404,640 Bellwin grant from the Department for Communities and Local Government. 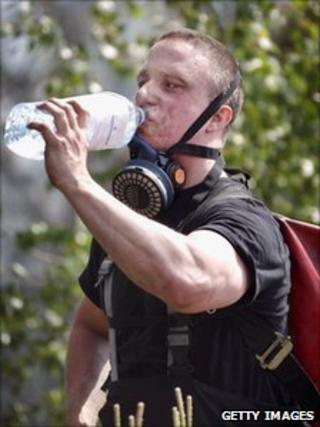 The Bellwin grant is a fund put aside for fire services or local authorities to apply for after emergencies. The grant would include the £300,000 Berkshire paid to other fire services for their work in the county. The fire in May was the largest incident, in terms of resources, ever dealt with by RBFRS. Twelve fire crews in total attended the fire, including wildfire experts from Northumberland. Families were evacuated from their homes in nearby Crowthorne and several roads were closed. Businesses were also affected, with the Look Out, Coral Reef and the Golden Retriever pub closed for several days.